We are specialized in the manufacturing and supplying of high quality oil pan gaskets. The oil pan gasket set offered by us is used in various industrial and engineering applications. We are specialized in the manufacturing and supplying of high quality Oil Pan Gaskets. 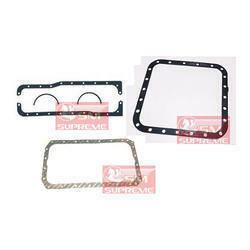 The Oil Pan Gasket Set offered by us is used in various industrial and engineering applications. We are considered as one of the ace Oil Pan Engine Gaskets Exporters and Suppliers in India. At sccare, we have an extensive machine park and a department which specializes in handmade products. We have a wide range of materials including rubber (nr, sbr, nbr, h-nbr, acm, cr, pu, fe, epdm, fkm/fpm, ffkm, vmq, fvmq, csm, pbr, vamac) graphite, non-asbestos sheet, plastic, ptfe, felt, rubber cork, etc. 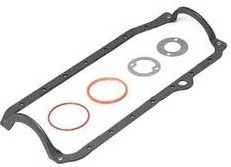 Oil Pan Gaskets are also manufacture in Rubber Cork CAF Non Asbestos and Oil Resistant Sellolus Jointing material. In case of rubber rocker covers these are also manufacture in Synthetic and silicon rubber or as per buyer's requirement of materials. We are a prominent manufacturer and supplier of Oil Pan Gaskets. These gaskets finds application in both industrial and engineering areas. These gaskets are offered at suitable prices. We have Cylinder Head Gaskets that are attaining a very high popularity now a days. With our main mission of customer satisfaction with superior quality product , we always deliver items on very competitive prices. With increasing power outputs and shrinking engine weights, cylinder head design is becoming more complex. Avail from us superior quality Oil Pan Gaskets. These Oil Pan Gaskets are Manufactured using latest technology, these products enables us to meet the dynamic demands in market. The products cater to the needs of various industries such as automotive industry. Oil Pan Gaskets are also manufacture in Rubber, Cork, CAF, Non-Asbestos and Oil Resistant Sellolus Jointing material. In case of rubber rocker covers these are also manufacture in Synthetic and silicon rubber or as per buyer's requirement of materials.